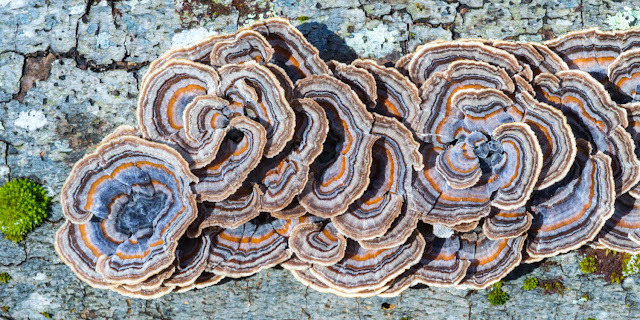 Most polypore fungi are found on wood, and they are just doing their job, which is breaking down the lignins in the wood. 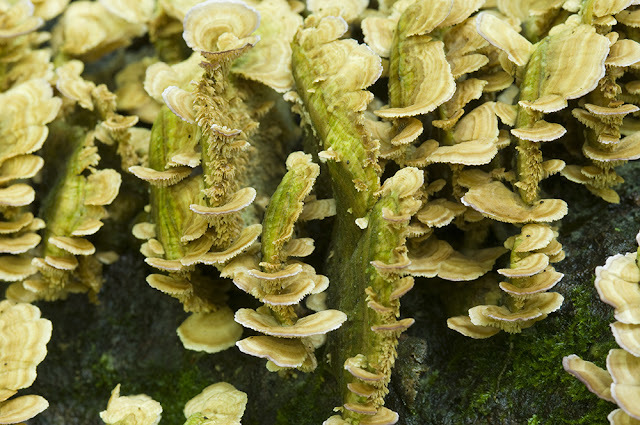 Fungi are great recyclers. 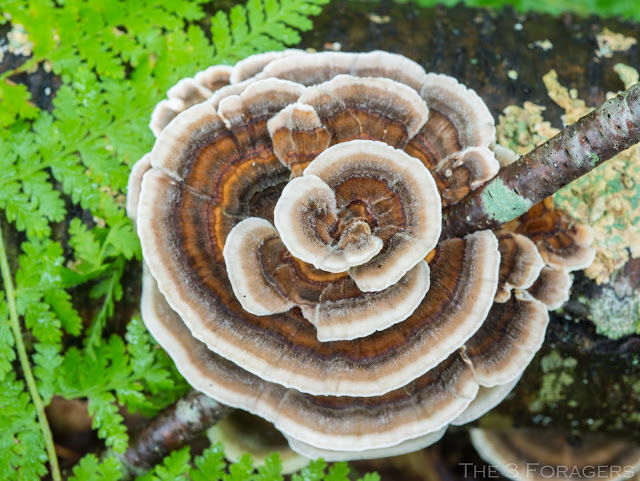 Many of the harder polypores can persist for a whole year or longer, and we can always find them in the forest in different stages of freshness and ages. 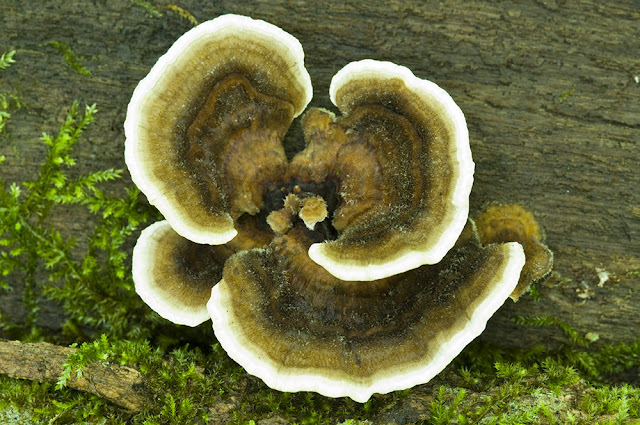 While polypores tend to be tough and dull with age, they can be brilliantly colored and flexible when fresh. 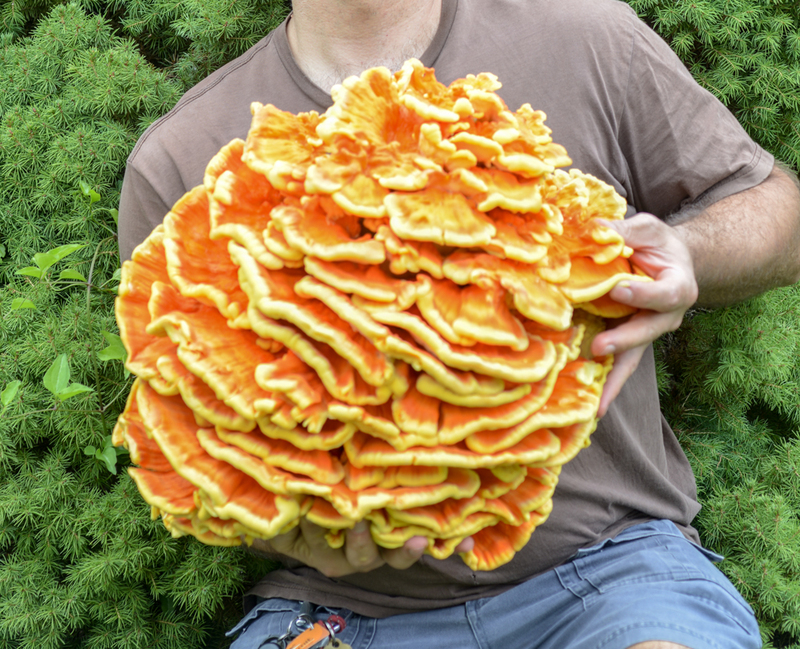 The weather has been hot and dry for nearly the whole month of August, so mushrooming in Connecticut has been poor. 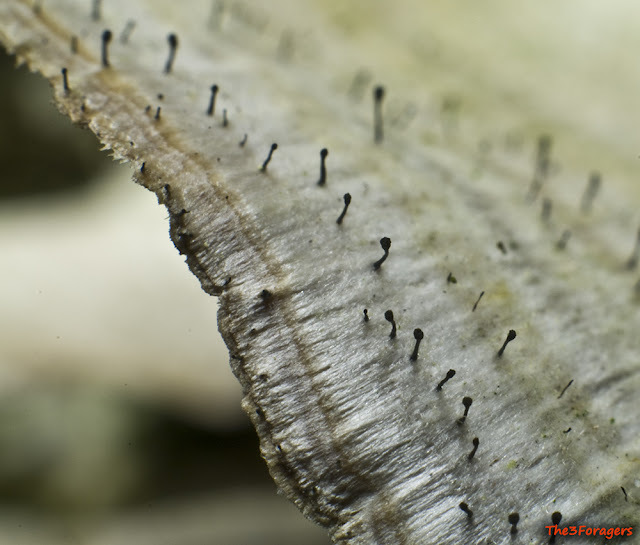 Our forays with CVMS have consisted of a lot of polypores and wood decayers, and few fleshy mushrooms. But, one of our favorites to eat is the chicken mushroom, one of those wood decayers, and the harvest for them has been good. We can only eat so much "chicken" pot pie (Gillian's favorite), eat so much curried "chicken", make so many sandwiches and wraps with "chicken" salad, and make so many sausages (we still have about 60 in the freezer), so we needed to come up with some new ways to use up some fresh chicken that was gifted to us by other mushroomers who couldn't eat their entire haul. 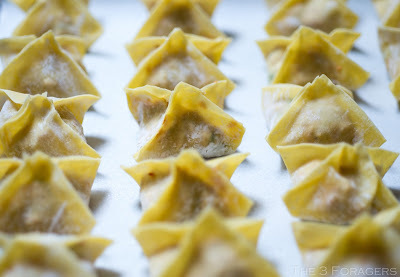 This isn't even a real, measured recipe, I just used what I had and ended up with a few dozen wontons. I chose to oven bake them rather than frying them and they crisped up nicely. 1. In a food processor, pulse the chicken mushroom fronds until finely chopped. 2. In a large skillet, heat about 2 Tbsp. of the sunflower oil (or any other neutral-flavored oil) over medium heat and lightly cook the chopped mushroom. Add enough hot water to completely cover the chopped mushrooms in the pan, and poach the chopped pieces until the water evaporates, about 15 minutes. 3. While the chopped mushrooms are poaching and the liquid is reducing, finely chop the garlic and ginger, or use a microplane and shred them finely. 4. Once the liquid has evaporated from the pan, push the mushrooms to the side and add a drizzle of oil to the empty part of the pan. Cook the ginger and garlic for 2-3 minutes without allowing it to color, then stir them into the cooked chicken mushroom. Remove from the heat. 5. Toss in chopped scallions for color and season with some soy sauce, salt, and pepper. 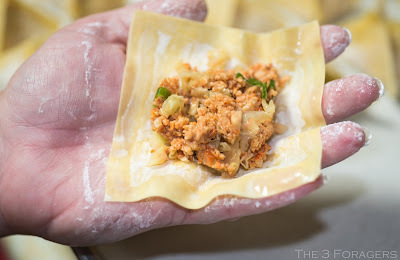 Allow the filling mixture to cool, it should be moist, but fairly dry. 6. 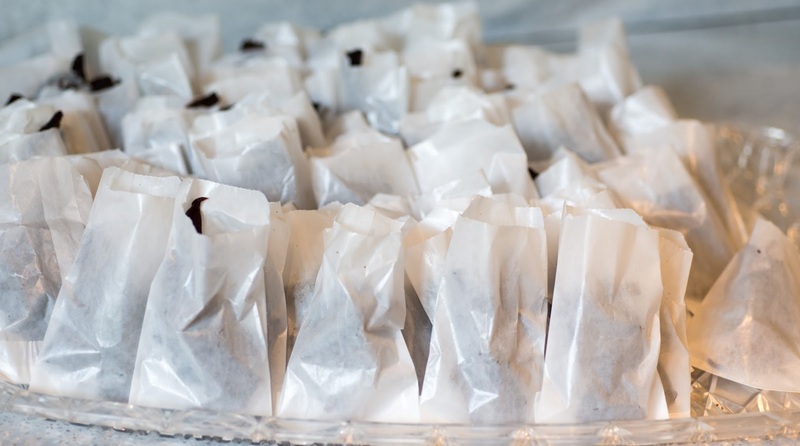 Heat oven to 425ºF and prepare a sheetpan with parchment paper. 7. Lightly moisten the edges of a wonton wrapper with your finger. Place about 1-2 tsp. of filling in the center of the wrapper and close. 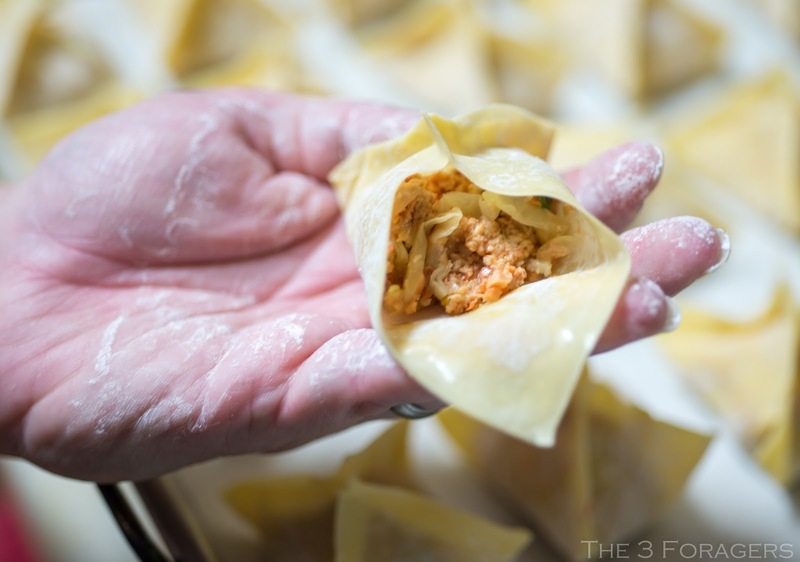 You can simply fold the wonton wrapper in half and pinch the edges, or close it in a more elaborate manner. I brought the four corners of the wrapper together in the center and sealed the remaining edges, making a square pouch shape. 8. Place the wontons on the parchment and spray them lightly with vegetable oil, and bake for 10-15 minutes, until browned and crisped. 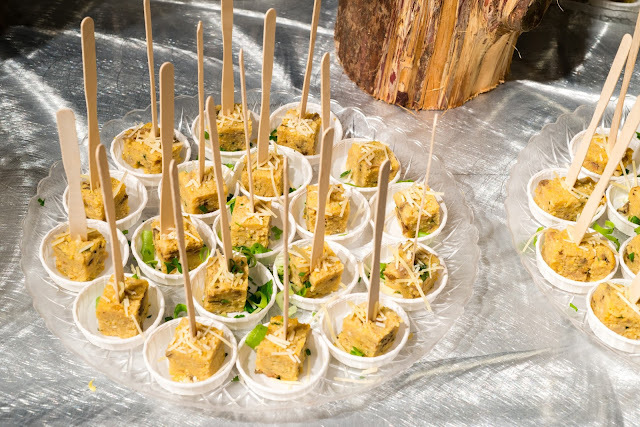 Serve with additional soy sauce or dumpling sauce for dipping. 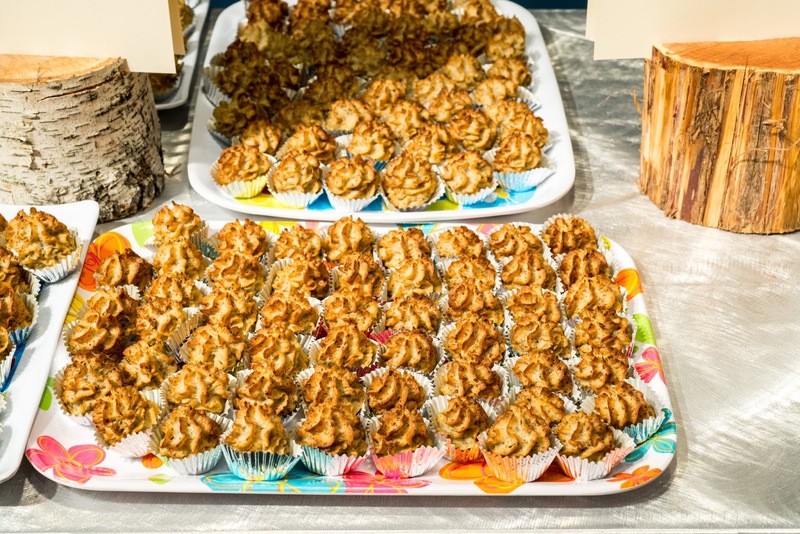 Last weekend our mushroom club, Connecticut Valley Mycological Society, was honored to host the 39th Annual Sam Ristich Foray, held by the member mushroom clubs of the Northeast Mycological Federation. 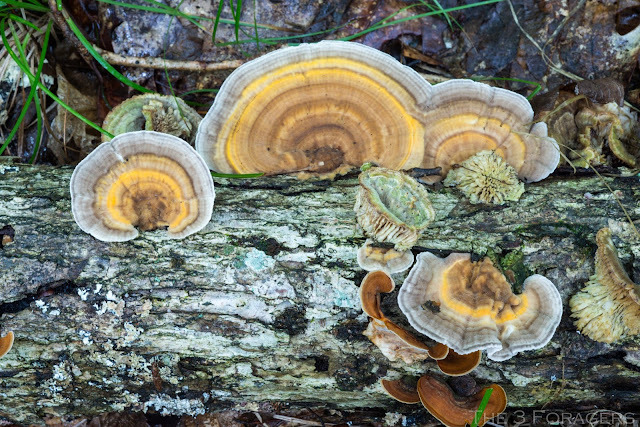 Our location was Connecticut College, in New London, Connecticut, allowing us to share the forests and parks of southeastern Connecticut that we are very familiar with. 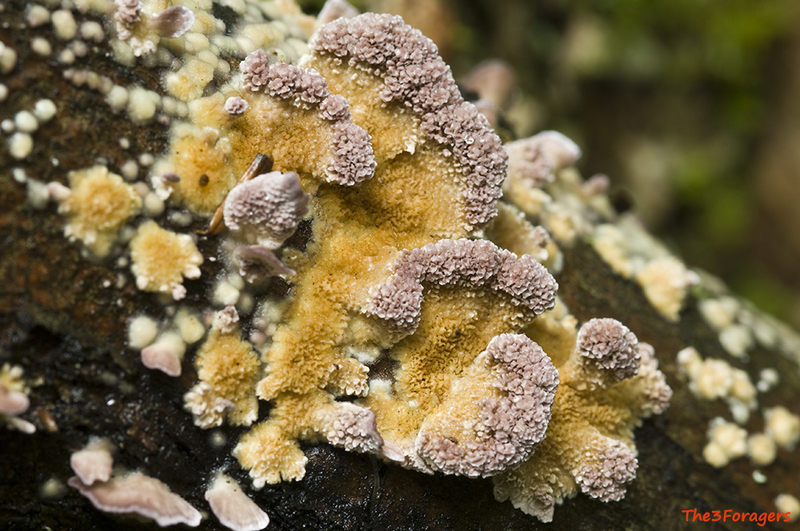 The four-day conference featured organized forays, classes on mushroom dying, medicinal mushrooms, microscopy, taxonomic name changes, and toxic mushrooms. We were honored to have as a instructors and identifying mycologists Alan and Arleen Besette, Gary Lincoff, Rick Van de Poll, Dorothy Smullen, Walt Sturgeon, Renee LeBeuf, Roz Lowen, Jason Karakehian, Jon Plischke, Sue Hopkins, Dianna Smith, Rod Tulloss, Alison Birks, Ed Mena, and Bill Yule. Mycophagy is the cooking and eating of mushrooms for pleasure, and in our case along with a large amount of mushroom hunters, we cook wild mushrooms. 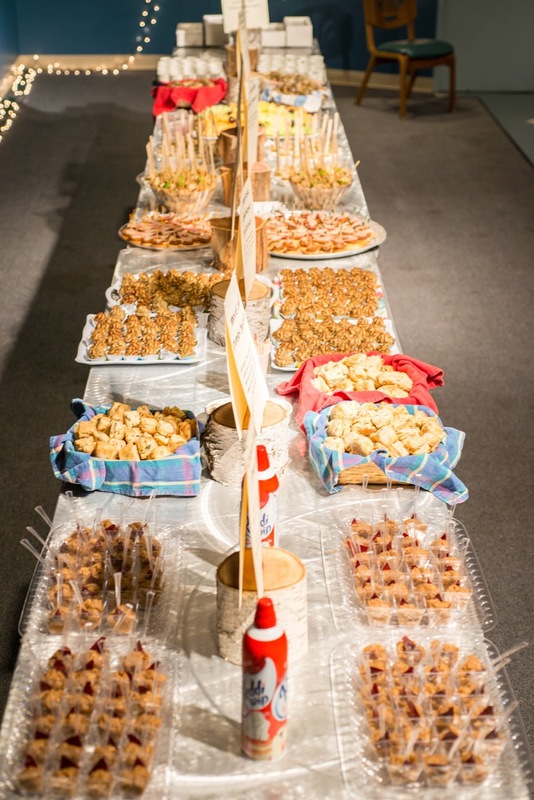 Robert and I, along with a few very dedicated and skilled volunteers, cooked up the mycophagy for 190 people on Friday night. Most of the recipes we used are our own, original recipes, while others like the Black Trumpet Soup Shooters were made as we went along, starting from a general idea of what we wanted and tasting as we went along. Maitake Jerky, made with donated hens (Grifola frondosa) from several CVMS members last fall, as we were not able to find very many ourselves. After the jerky was made last fall, we vacuum packed it to last over the winter, and then portioned it out into small, waxed bags to enjoy as a snack. 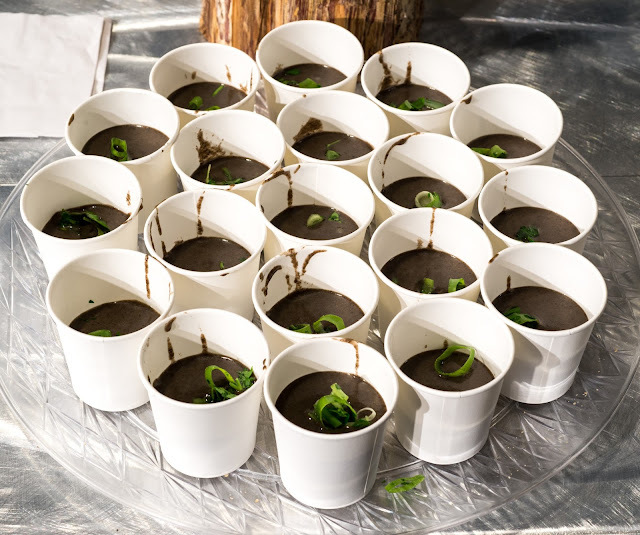 Black Trumpet Soup Shooters were served warm in paper espresso cups. It was a lovely, smooth soup made with fresh black trumpets (Craterellus fallax), celery, onions, potatoes, and thyme, with just a touch of cream and a parsley/scallion garnish. Black Trumpet Choux filled with Black Trumpet Cream Cheese is one of my favorites. The choux pastries were made with dehydrated black trumpets (Craterellus fallax) collected last year while attending the NEMF foray in Maine.We collected many pounds of trumpets; luckily we traveled to the foray with dehydrators and brought home several gallons of dried mushrooms which are powdered for this recipe. 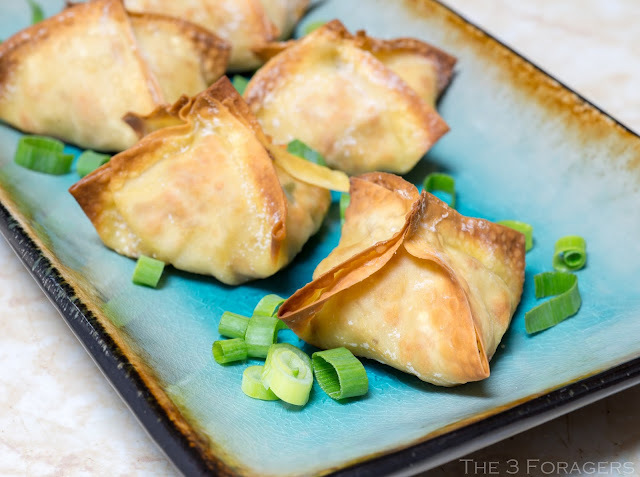 The cream cheese filling is made with fresh, sauteed black trumpets and chopped scallions. Our bolete season is very unpredictable, so bought some West Coast boletes (Boletus regius) from a forager in Oregon to make into these Porcini Polenta Cubes. I rehydrated the dried porcini in vegetable broth before sauteing them butter, then added it all back into the cooked polenta along with Parmesan cheese and fresh parsley. 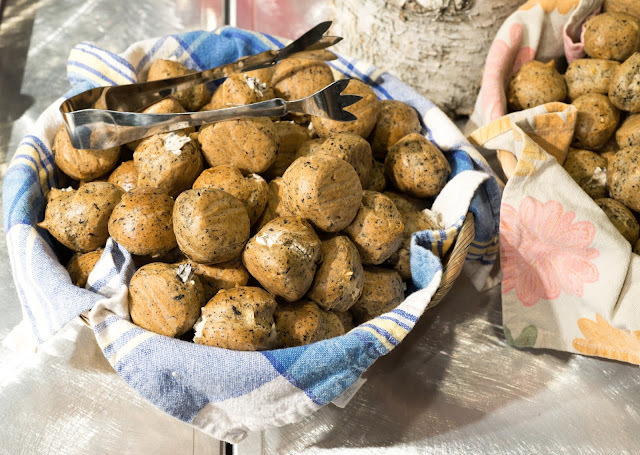 These are Hen Duchesse Potatoes, a fun appetizer I make often to use up all the little bits and pieces left over when cleaning hens (Grifola frondosa) to make jerky. The hen bits are finely chopped in the food processor with some onion before being browned and oven roasted, then added to mashed potatoes with a bit of egg and seasoning. I pipe them into small cupcake papers and cook them until nicely browned. Morel and Ramps Greens Biscuits were made from morels (Morchella americana) we collected last spring and ramps greens that we collected and froze from this spring. 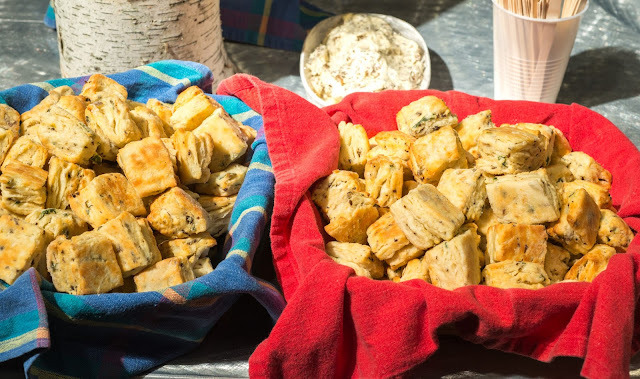 I had extra rehydrated and sauteed morels, so I blended them into butter to spread onto the biscuits. Thai King Oyster Skewers are made from a full, 11 pound case of king oysters (Pleurotus eryngii) from the local Asian market. 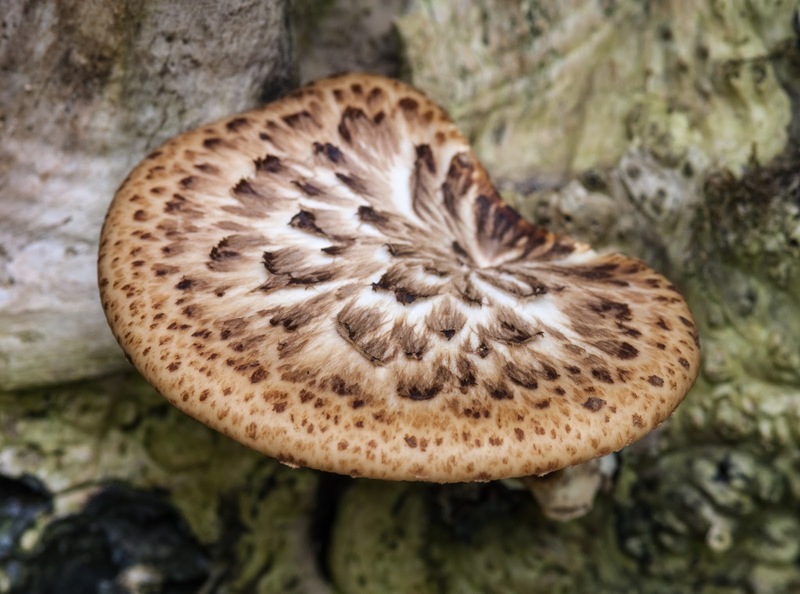 The stems are sliced into discs about 1/4" thick, then sauteed until browned before being poached in a tom-ka broth until the broth reduces. 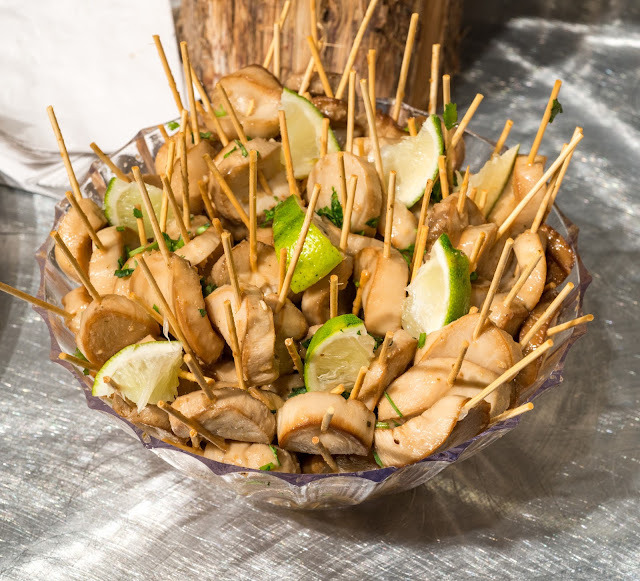 Prepared this way, the mushrooms take on a similar texture as scallops with a Thai-flavored coating of tom-ka. 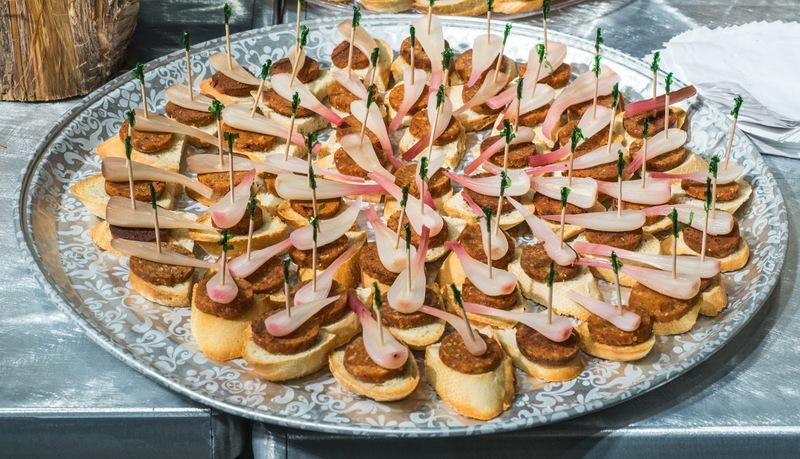 "Chicken" Sausage Toasts with Garlic Mustard-Mustard and Pickled Ramps uses 3 of our recipes. We stacked the crisped chicken (Laetiporus sulphureus) sausage slices on toasted baguettes with a smear of the spicy mustard (Alliaria petiolata) and a sweet/sour garnish of ramps (Allium tricoccum) pickle. 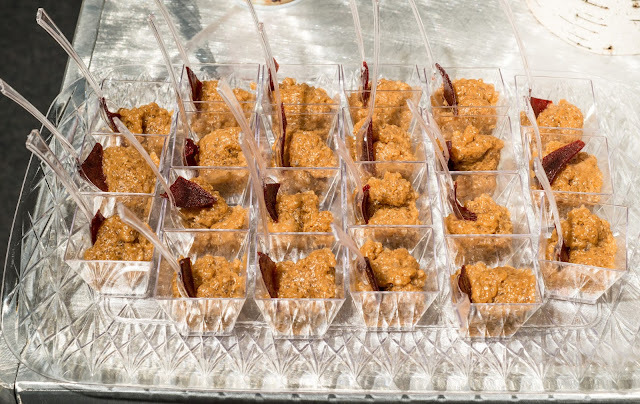 And for our mushroom dessert, we served Chaga Tapioca Pudding garnished with some beach plum fruit leather wedges. First we make Chaga Frappe (Inonotus obliquus) with some coconut milk and maple syrup, then we cook the frappe into a tapioca pudding. Guests were able to add a bit of whipped cream if desired.